USA’s Nathan Chen performs his Free Skate at the 2018 Internationaux de France. Chen received an edge call on his opening quad flip and triple flip in combination with a triple toe, but otherwise nailed a quad toe and showed strong level 4 spins throughout his routine to “Land of All” by Woodkid. 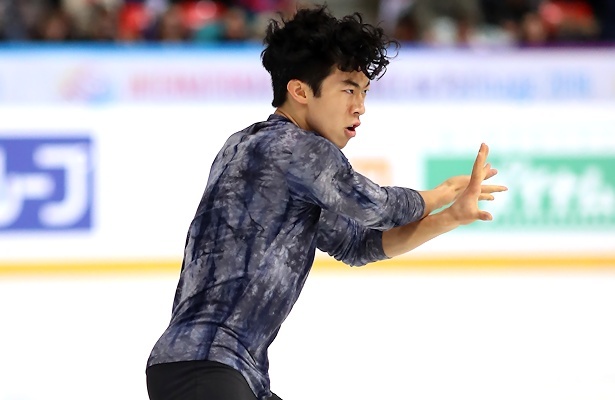 The Skate America gold medalist earned 184.64 for first-place finish in the free skate and overall (271.58) to seal his slot at the upcoming Grand Prix Final (GPF) next month. Dmitri Aliev of Russia, who stood in ninth after the short, finished second in the free skate (162.67) and rose to fourth overall (237.82). The Lombardia Trophy silver medalist landed a quad toe-triple toe as well as seven triple jumps and showed strong level 3 steps. Brown finished third in the free skate with a new season’s best of 159.92 points. His routine to a Simon & Garfunkel medley featured strong spins and footwork, however, the Four Continents bronze medalist doubled a triple Axel and triple Lutz, and under-rotated another triple Axel in combination with a double toe-double loop. Samarin under-rotated a quad Lutz and triple Axel in his routine to music from The Greatest Showman soundtrack. Nevertheless, the 20-year-old landed a quad toe-double toe and a triple Axel double toe and was awarded 156.23 points for a fourth-place finish in the free skate and third overall (247.09). Kevin Aymoz of France finished fifth overall (231.16), followed by Romain Ponsart of France (229.86).